This is possibly the best manicure I've had in a while. I love the color. 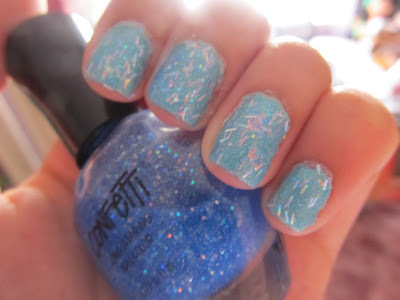 I love the sparkles. I just love everything about it. Yum. This is the base color. 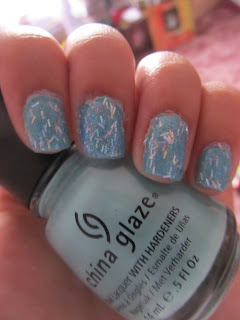 It is China Glaze in For Aubrey. I used two coats. These are the bigger flakies. They are silver but the reflection on the is like a rainbow. 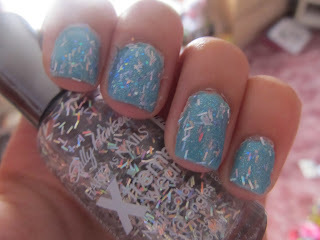 It is Sally Hansen Xtreme wear in In the Spotlight. It's so pretty and I will probably layer this over everything I wear in the near future. This was with two coats. Here is the polish with the smaller sparkles. It is Confetti in Party Palace Blue. The base is mostly clear but it did make For Audrey a little more blue then its original state. This is with three coats.